No worse than the UK for unpreparedness!! Even we don’t have summer/winter closets though, could never understand that… November in Italy is normally quite nice, cool at night, but 20+ degrees during the day sometimes, like now… I always go at this time for three weeks before Christmas, to tidy the garden and shut the house up safe before January & February and any really cold & nasty weather. Whatever time of year, the weather is always better than the UK! Love the way you write about Italy! Thank you. Thank you so much – I really appreciate it! Writing about Italy comes easy for me… So much material and memories to get down on paper. To answer your question, YES I’ve worn a hat in bed before. In Italy, of course. Haha, then I’m not alone. Thanks for following along! 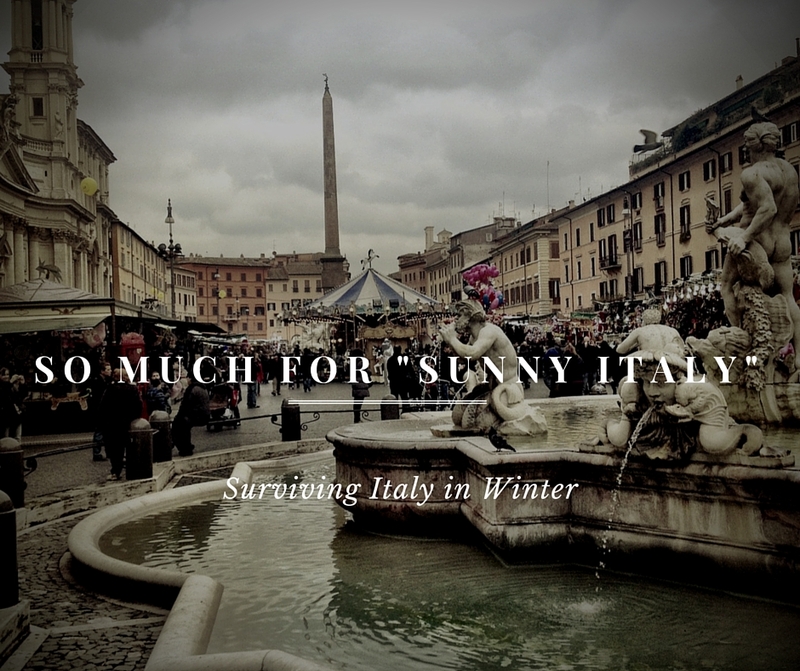 “Sunny Italy” is a (false) notion created and diffused by folks in the UK or Northern Europe! For you and I from California and Florida, it’s COLD!!! I arrived January 3, 2009… and I wore a hat to bed that first night!! I woke up shivering (already wearing multiple layers) and suffering from jet-lag. I had never been so cold before. Now I’m just used to it and cuddle up to my hot water bottle. As far as cambia di stagione.. I was a bit furba this year and had everything cleaned and ready by the end of September.. it got cold and I was ready while everyone else was turning their stoves on to dry clothes. I may have had piles of laundry for weeks.. but it was worth it in the end. Ugh, the drying of the clothes! Totally forgot to mention that. The WORST! Thanks so much for reading. At home I had always big wardrobes and carpets. I saw big wardrobes in any house in the south I visited and there is enough room in there for summer and winter robes. It is just a matter of how to organizing it. About buildings. I lived with ease in homes built in 1960’s and 1970’s. The one built in sixties was my grandma home apartment I lived here when child. It has no heating but it becames hot just with turning on a stufetta. I lived in a 70’s apartment with central building heating and it was cold in summer and hot in winter. A very confortable building even with marble floors. In the eighties we moved to another apartment in a 1981 building and it was awful… Atrociously hot in summer, and abnormally cold in winter even if it has gas autonomous heating. So I feel confident to advice you to check carefully how it is made your apartments building and preferring those built in 19th century. Houses of 1800 were made if stones or solid bricks and very efficient thermically. Houses and buildings of 1910, 1920, 1930, 1940 unless if built by the original owner should be checkef carefully as buolding methods changed quickly in those years, and often contsins also asbest in the roofs (mainly 1940). Houses and buildings of 1950, 1960 and 1970 were nearly to perfection, built for confort, well made, good materials. Rooms are large in these apartments and rich in receiving daylight. Ceilings are at 4 meters of high and allow you to keep room for high wardrobes. Remember also that medium size of apartments in Italy is 90 square meters that it is more than the average european apartment size. My eighties apartment is a penthouse and it is 90 square meters plus 80 meters of cover terrace. My 1970 apartment was 110 square meters and had four rooms, two bathrooms, entrance, living kitchen, a store room and an extra mini room thst you can use for kids playing or extra bedroom for the colf. My grandma house is 120 square meters. I doubt you can find easily and a reasonable prices apartments so big in great european cities or american ones where average number of room is limited to two rooms and very few spaces for robes and clothes. Houses and buildings after 1980 have usually 3 rooms only (75/80 square meters usually), few windows or balcony doors (so lesser daylight enters) and ceiling is very low 3,50 meters that limits enormously headroom and space for wardrobes. The switch lira/euro was a disaster. My family bought our penthouse just at 130.000.000 lire in 1981 that is barely 65.000 euro. In the end of 2000 it was priced 300.000.000 circa that is 150.000 euro. After euro was introduced Italy suffered a big speculaton that doubled prices of ANYTHING. To make an example a can of soda that was priced 500 lire, 25 eurocents is nowadays priced 60 cents 25+25+10 cents of inflation. If you buy it in bars it is priced 1 euro and the price is even more expensive heading to north Italy. 1 Kg of bread was priced 1000 lire, 52 eurocents. Nowadays it costs 2 euro, and in Bologna prices of 1 Kg of bread could cost even 4 euro. This fact halved the buying capabilities of us italians who suffered this terrible speculation upon euro currency. Prices doubled and salaries were always the same. So then italians drastically reduced their expenses and prices of houses had a crazy rampage as we see our houses. Nowadays my apartment has a medium exteem price of 350,000 Euro. So in the end if you want to spend winters in Italy and you are an expat check carefully buildings if you want to rent or buy a house or an apartment. Hai ragione, Barbara! It just seemed to translate better to English that way – although it doesn’t really make sense either way. Thanks for the clarification though. I like your way better, and will update it!